Pan is an ambitious 2015 live-action fantasy adventure from director Joe Wright (Pride & Prejudice, Hanna) that’s as different as can be from previous film versions of J.M. Barrie’s tale of Peter Pan—and not just because it’s an origin story. 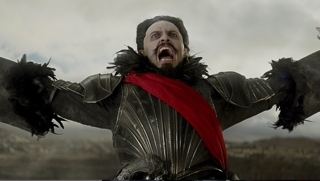 For starters, Hugh Jackman plays a post-apocalyptic looking villain with the kind of flamboyant flair we saw from David Bowie in Labyrinth, and the villain he plays isn’t even Captain Hook. It’s the pirate Blackbeard, who’s snatching British orphans from their beds and taking them to Neverland in his flying ship to work in his fairy dust mines—reminiscent of what we saw in the second Indiana Jones movie. You’ll also have Indy flashbacks when you meet James Hook (Garrett Hedlund), an adventurer whose Fedora and mannerisms seem unmistakably patterned after the character Harrison Ford made famous. Thankfully those “influences” fall short of seeming like rip-offs. Partly that’s because Pan has distinctively edgy look and feel to it, as if a punk-rock band got inspired by The Who’s rock opera Tommy and decided to make a film of their own . . . without the songs. 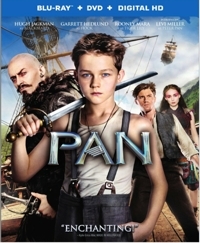 This fantasy has more fantastic elements to it than even Barrie could have imagined, and young Peter (Levi Miller) goes from being an orphan with a pan pipe necklace and a mother he tries to track down to a budding superhero who finds his place not in London but in Neverland, where he will become champion of the downtrodden. The people he defends—the Indians of Neverland—are a curious bunch, though. Tiger Lily (Rooney Mara) seems Eurasian, while others of her “tribe” are Asians, blacks, and Latinos. Was this done to avoid racial stereotyping? Possibly, and I wouldn’t blame them. Look at the crap that Disney took for Pocahontas, and they even were careful enough to create a strong, positive heroine who was voiced by a Native American actress. But in Pan the whole idea of “tribe” seems weirdly subverted by multiculturalism. Those weirdnesses aside, Pan is an energetic fantasy that will satisfy your curiosity about the early days of Peter Pan and his Neverland rivals, unless you’re like my son and you expect to see the story of how Hook lost his arm to the crocodile. Sorry. It’s not here. But would it help to know that the crocodile is animated more like a grand sea monster than the cute nemesis Disney dreamed up? In general, the special and visual effects are quite good, as is the production design. 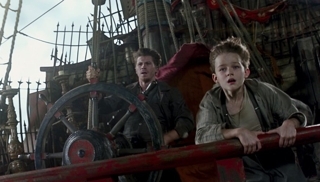 We buy this bleaker, post-apocalyptic version of Neverland precisely because it seems so far-out and young Miller as Pan and the others seem so believably earnest. The action scenes are also more honest and intense than we normally see in a Barrie adaptation. Yes, it’s a little over-the-top in spots and as fantastic as fantasy gets, but Pan is entertaining enough not just for one family movie night, but for replays as well. 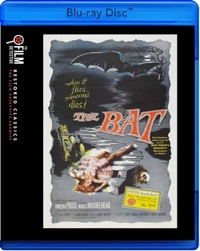 The Bat (1959) is billed as horror-thriller-mystery, but the way those genres have evolved over time it’s now mostly a straight-up mystery, noir style. 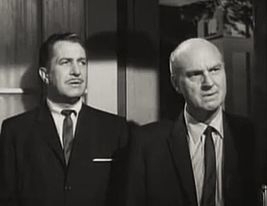 Vincent Price stars as a doctor doing bat research and Agnes Moorehead (Bewitched) as a mystery writer looking for new material. She finds plenty at an old country estate she’s rented—a quintessential dark-and-stormy-night Victorian mansion that comes with servants . . . at least until they’ve abandoned her because they’re convinced a murderer called The Bat might be returning to the scene of his crimes. A local detective (Gavin Gordon) plods around and a complicating factor is that bank securities were recently stolen and may be stashed somewhere inside that same creepy old house. A lot happens, but the spotlight is on Price and Moorehead, two iconic actors. The Bat won’t be for everyone, but if your children aren’t averse to old black-and-white movies, this one is family-friendly. The violence is mostly bloodless or mostly off-screen, and the focus is on the mystery. My son is a teen who appreciates good plotting, and he and I both marveled how a relatively simple concept could be complicated by believable twists and enhanced by cinematography that showcases all the shadows and angles we’ve come to associate with film noir. There are only a few melodramatic moments, with otherwise straight dramatic acting—decent acting, too. Director Crane Wilbur had written the script for the Price horror classic House of Wax, so it’s not surprising that with Price in the starring role he’d slip in a few Gothic elements here too. Old films like this are often campy, but while The Bat has its unintentionally funny or tongue-in-cheek moments, it really is a mystery that unapologetically goes about it’s business of planting clues and red herrings. There are a few slasher moments, and The Bat’s hat and distorted face and claws will suggest to horror-slasher fans that this film may have had a direct influence on the Freddy Krueger character design from the popular A Nightmare on Elm Street series. That’s kind of cool for film buffs, who might also find it fun that Darla from the original Our Gang/Little Rascals short films turns up as one of the adult female characters. And it’s certainly enjoyable seeing Moorehead in a serious role before she turned into one of TV’s most famous witches. The Bat is now in the public domain, and while The Film Detective’s restored version looks good, for the most part, there are vertical white lines in spots and other flaws that are obviously a part of whatever print was used for the master. I haven’t seen the DVD version so I can’t offer a comparison, but I have no complaints other than what I just mentioned. I asked my son what grade he’d give this, and he said a B+ or A-, since he really liked it. That’s almost ironic, because Price went on record as saying he thought the script wasn’t very good. I lean toward a B for this B-movie because mystery fans will recognize a formula and certain other conventions. That’s part of the genre, but the bottom line is always how well were those conventions and plot points integrated and developed? With The Bat, I’d have to say it does a fairly decent job on both counts, and still holds up today. If you grab a copy for a family home movie night, you might as well go all out and for the warm-up also show a “Thriller” video featuring iconic horror actor Price—maybe even dance a bit. Those are the kind of things your kids will remember years from now! There have been so many mediocre or downright bad Christmas movies that my family approaches every new one with as much suspicion and guarded anticipation as a child shaking presents under the tree. But the thing about low expectations is that it leaves the door open for occasional surprises . . . like Santa’s Little Helper. This 2015 film from WWE Studios, distributed by Fox, won’t make it onto anyone’s best Christmas movies list no matter how many times you check it. Santa’s Little Helper looks and feels like a made-for-TV movie, but it’s surprisingly entertaining. The biggest surprise is that the film’s star—World Wrestling Entertainment dynamo Mike “The Miz” Mizanin—turns out to be as good of an actor as the most famous wrestler-turned-actor, Dwayne “The Rock” Johnson. This guy has a future in comedy and displays way more expression and range than body-builder-turned-actor Arnold Schwarzenegger. Plus, because he comes across as a regular guy except when the script calls for him to look as if he’s posing for a GQ cover, he’s actually pretty likable. Good thing, because everyone who wants to step up and ring the Christmas bell tries to do so with the same old recycled plots. In Santa’s Little Helper, a youth center is going to close because they can’t keep up with the mortgage payments. Add music and change “youth center” to “church” and you’ve got The Preacher’s Wife. Mizanin plays the Scrooge that gleefully hands them their notice. He’s a corporate hatchet man who delights in serving those kinds of papers, and naturally he’s also an alum of that youth center. Like the real estate developer in The Preacher’s Wife he’ll have his turnaround, but Santa’s Little Helper throws in a lot more fantasy . . . and a little more cheesiness. The wholesomeness meter dips a bit when we go to the North Pole and see one of Santa’s helpers looking more like a hot calendar model than an elf. Given her skimpy short-shorts, it’s hard not to think of another context when she and Santa talk about filling the job of “Ho Ho Ho”—Santa’s #1 elf. But former model AnnaLynne McCord gets to be a lot nicer and more wholesome than the characters she’s played on Nip/Tuck or 90210. Like the angel Clarence in It’s a Wonderful Life, she’s given the task of interacting with a mortal and trying to convince him of something. In this case, Santa wants her to put Dax (Mizanin) through a series of challenges to test his temper and gauge his mettle to see if he’d be a contender for the Ho Ho Ho position, as Santa suspects. Her job is to convince him that this dream job with its unspecified brand and CEO are worth jumping through all the hoops. The filmmakers try to address the inconsistency of having a human as top elf, and the explanation they offer won’t satisfy some viewers—adults especially. But hey, it’s fantasy, and that means anything goes . . . or almost anything. WWE wrestler Paige, a two-time Divas Championship winner, plays the daughter of an elf who last held the Ho Ho Ho position. Unfortunately, she’s seems an afterthought: hey, we need an antagonist, don’t we? She tries, but she really doesn’t have the acting chops of the other two and really doesn’t have much to do until the third act, when the plot shifts from Dax’s tests and trials to a full-out competition for the Ho Ho Ho job. As I said, there’s nothing new here and no great set design or special effects. But unlike many crank-em-out Christmas movies that are sappy or just plain dull, this one is fun to watch. And that’s mainly because Mizanin and McCord are enjoyable to watch—despite a script that calls for him to go shirtless and flex, and for her to dress to showcase her own physique. Still, the sexuality is muted compared to most films these days, and there is no (repeat, NO) sexual tension between the two main characters. That keeps it wholesome, and good thing. Kids will like this one more than adults, but that pretty much goes for all things Christmas, doesn’t it? Takeaway: I suspect we’ll be hearing more from Mizanin.